RT Stratos - chic pattern from popular developers RocketTheme, supports Joomla 2.5 and 3.1. This template contains 8 preset styles, light and dark themes that can be combined with the spectacular transformation of CSS styles, give the layout a special appearance. 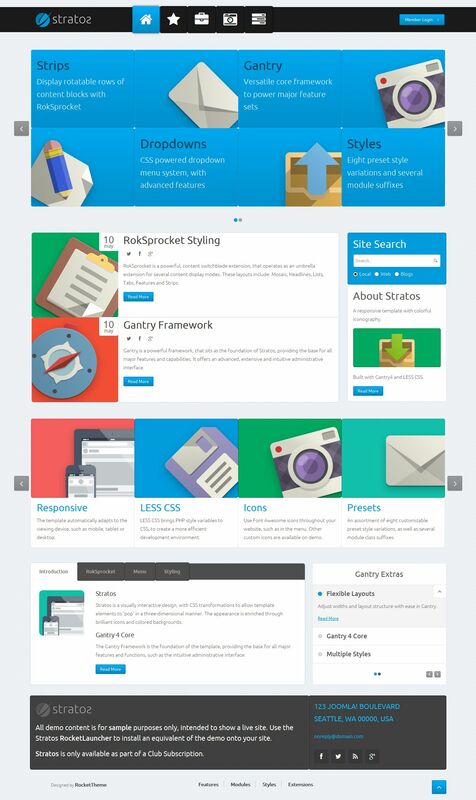 Template is designed on a modern platform Gantry Framework, for its operation, advanced web - technology. For easy and clear presentation of content site uses a proprietary tool RokSprocket, which provides display data in a different form. The presence of adaptive traits template provides the correct site work on any screen, tablets and mobile devices. The structure of the template includes additional styles for the component K2.